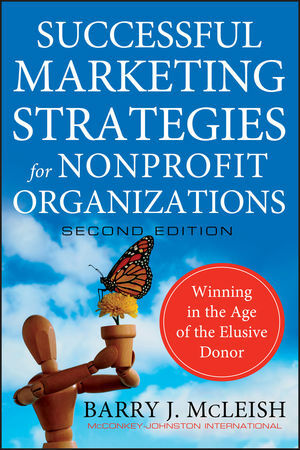 In Successful Marketing Strategies for Nonprofit Organizations, Second Edition, nonprofit marketing guru Barry J. McLeish shares everything he's learned during more than two decades managing and consulting nonprofits of every shape and size. Skipping all the arcane theory and the business school jargon, he gives you clear, step-by-step advice and guidance and all the tools you need to develop and implement a sophisticated marketing program tailored to your organization's needs and goals. Do you need to breathe new life into your existing marketing department? Successful Marketing Strategies for Nonprofit Organizations, Second Edition gives you the tools, the know-how, and the confidence you need to succeed. BARRY McLEISH is International Vice President at McConkey-Johnston International, a fundraising and marketing management consulting firm specializing in nonprofit organizations and associations. Before joining McConkey-Johnston, McLeish was the director of development for a $22 million nonprofit organization and served as project director for the organization's $30 million capital campaign. He is a frequent and popular seminar leader, having spoken at numerous conventions in the United States and Canada on fundraising, marketing, and market planning for nonprofit and for-profit organizations, including large marketing seminars for Merrill Lynch and the National Association of Manufacturers. He is the author of Yours, Mine, and Ours: Creating a Compelling Donor Experience (Wiley).